Wanted a quick way to count lines of code for some of my projects. Found this PowerShell command to dominate this task. Just hop in the directory you want to count the code for. You can change the file extensions below to meet your project's needs. 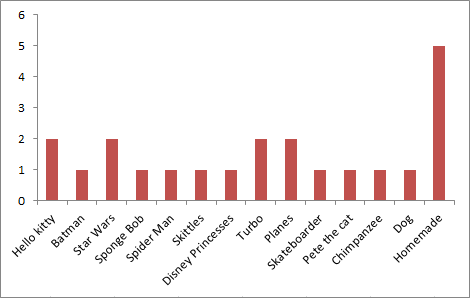 Both boys fresh off school Valentines parties, I decided it would be fun to gather some stats on Valentines received. We have a total of 24 Valentines, seems like we are missing some but that is all the boys made it home with. Some basic insights. Surprising number of homemade valentine's were received. The boys received a total of 5 home valentines comprising of 20.8% of all valentines received. For the number of ladies in the boys class we received a lower percentage of girly valentines than estimated. Girly being comprised of Disney Princesses, Hello Kitty, etc. 6 total Girly Valentines were received. 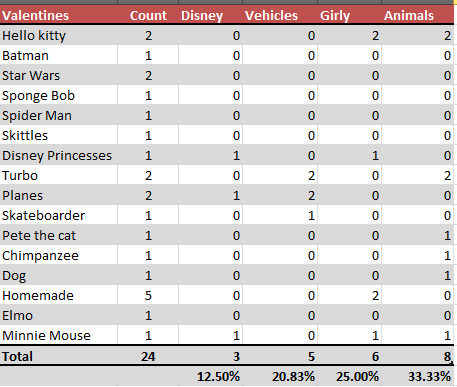 Aniamls had a strong showing with 33.33% of all Valentines featuring some kind of animal. The category used the term animal pretty liberally as Hello Kitty valentines were included in this count. Vehicles made up 20.83% of all Valentines received. I included Turbo the snail in vehicles, that could be considered a stretch. One of the homemade Valentines had a cookie. That seemed awesome. Luke made out a lot better in the candy department. Is Elmo an animal? I counted him as a monster.